Acne around and near the mouth usually refers to blackheads, whiteheads, and cystic spots that are on the chin, on the edges of your mouth, under the nose, and around the outer corners of your mouth. This type of acne can be mild or severe and caused by a number of different factors but either way, there are ways that you can treat and prevent it. What Is Acne Around the Mouth? This type of acne occurs when your pore openings become clogged. This can be due to excess oil from the sebaceous glands, bacteria, dirt, or dead skin cells. There are three main types of acne around or near the mouth. Blackheads - These under-the-surface lumps become dark in appearance due to how they open at the skin's surface and react with oxygen in the air, hence their name. Whiteheads - These are small, flesh-colored bumps with a white appearance due to their position just under the surface of the skin. Cystic spots - Found beneath the skin, these solid swellings contain pus and are extremely painful to touch. There are a number of potential causes of acne near your mouth depending on the specific infected area(s). 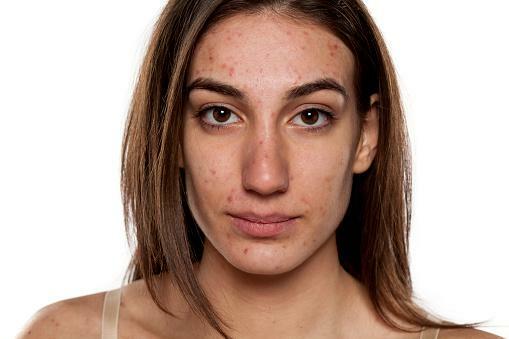 Around the outer corners and under the nose - Your diet can play a part with this type of acne. It's caused when residue from acidic foods, like lemon and vinegar-based dressings, irritates your skin and causes inflammation. Greasy remnants of fried foods, like burgers and fries, can also further block your pores in this area. On the chin - This acne occurs in women due to hormones. Testosterone fluctuates throughout your cycle and makes your glands produce more oil, thus resulting in an increased number of blocked pores. 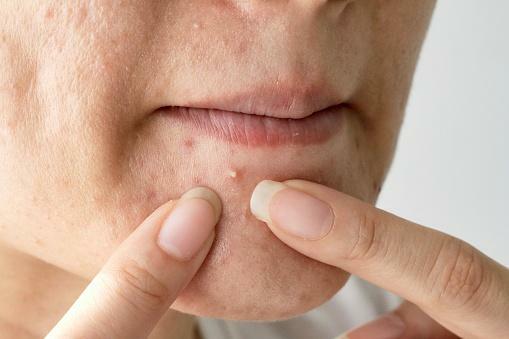 On the actual edges of your mouth - Overuse of scented and flavored lip balm can cause this type of acne. Toothpastes that contain sodium lauryl sulfate (SLS) can also be to blame. 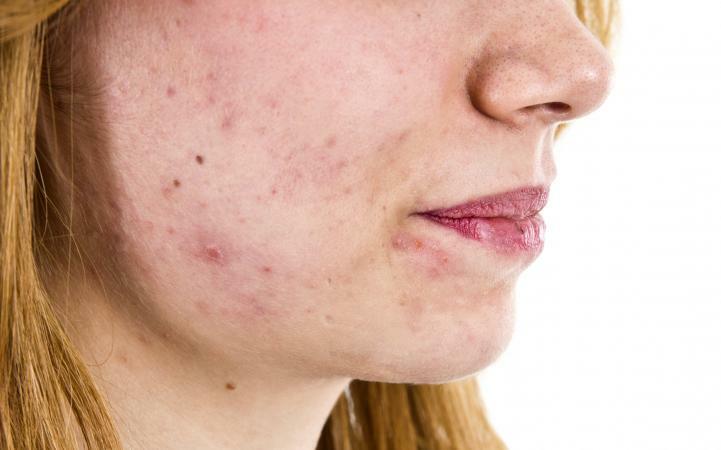 In all three places - If you have a rash of red bumps around the mouth that's quite scaly in appearance, contains fluids, and resembles acne, it might be perioral dermatitis. This skin condition is common and can also appear in the area under the eyes, on the forehead, and on the chin. There isn't a definitive cure for acne, but the following options will help to improve your symptoms. Around the outer corners and under the nose - Eating a healthy, balanced diet and not overindulging in greasy, acidic food can help when it comes to this type of acne. In addition, use a facial wipe after eating to remove invisible irritants around your mouth. On the chin - As these are hormonal spots in women, make sure you're looking after your skin especially well in the run-up to and during your period. You should be regularly using a cleanser with acne-fighting ingredient, like benzoyl peroxide or salicylic acid; however, apply a leave-on treatment with the same ingredient to treat specific flare-ups. Moreover, you could ask your doctor for a prescription treatment like birth control pills, which prevent breakouts by levelling out your hormones. On the actual edges of your mouth - Switch to a pure wax lip balm or stop using one altogether to eliminate this type of acne. Additionally, switch your toothpaste to one without SLS and rinse your face with warm water after brushing your teeth to clean the area. In all three places - If you think you have perioral dermatitis, stop using topical steroid creams or nasal sprays containing steroids in these areas. Using mild soaps instead of heavy skin creams and fluorinated toothpaste might also ease the symptoms. There are some other ways you can prevent this type of acne. Keep skin clean - Always wash your hands before dealing with your skin and cleanse the area around your mouth morning and night. Be religious in your skincare routine - Invest in skin products with acne-fighting ingredients. Experiment with clay masks, toners, alpha hydroxyl acid creams, oil-free moisturizers, and oil mattifiers to find out what combination works for you. Use home remedies - Some home remedies might be old wives' tales or internet legends, but they have been proven to work for some people. Give them a try for a quick-fix option. Visit your doctor or dermatologist - If your spots are really getting you down, head to a trusted doctor or dermatologist for medicated treatments, like topical retinoid creams or acne-fighting medication. Whether you're only experiencing mild breakouts in one area around the mouth, or severe breakouts all-over, this type of acne can be treated and prevented with the right tools and methods. Simply take the time to experiment with different options to find out what works for you, and the acne around your mouth will be looking and feeling better in no time.